Feng, K.; Lempert, M.; Tang, Y.; Tian, K.; Cooper, K.; Franch, X. Current agile methods are focused on practices of small, rapid developing and iteration, more people oriented, less documentation projects, and the use of the methods in large, product line projects are somehow difficult. UTD and GESSI have started a project to develop an expert system that can assist a requirements enginer in selecting a requirements engineering process that is well suited for their project, in particular with respect to the use of agile and product line engineering methods. To the best of our knowledge, this is the first expert system to do this. In this report, we present the project scenario requirements, development methodology, and the initial set of 162 project scenarios defined. In the future, version 2 of this report will be released, which will includes additional scenarios. This report is complemented with LSI-07-15-R.
Feng, K., Lempert, M., Tang, Y., Tian, K., Cooper, K., Franch, X. 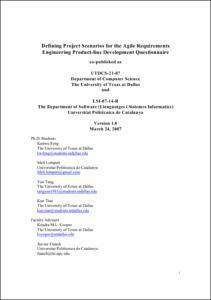 "Defining project scenarios for the agile requirements engineering product-line development questionnaire". 2007.